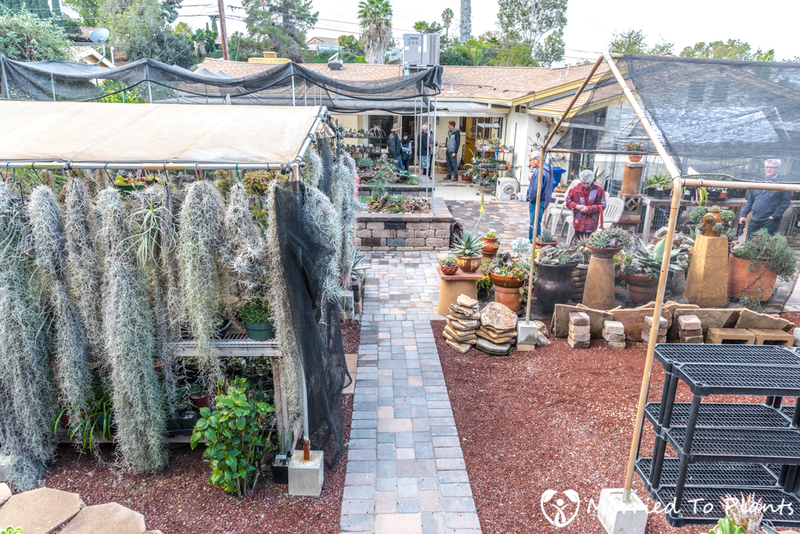 Not long ago I decided to join the San Diego Horticultural Society (SDHS). 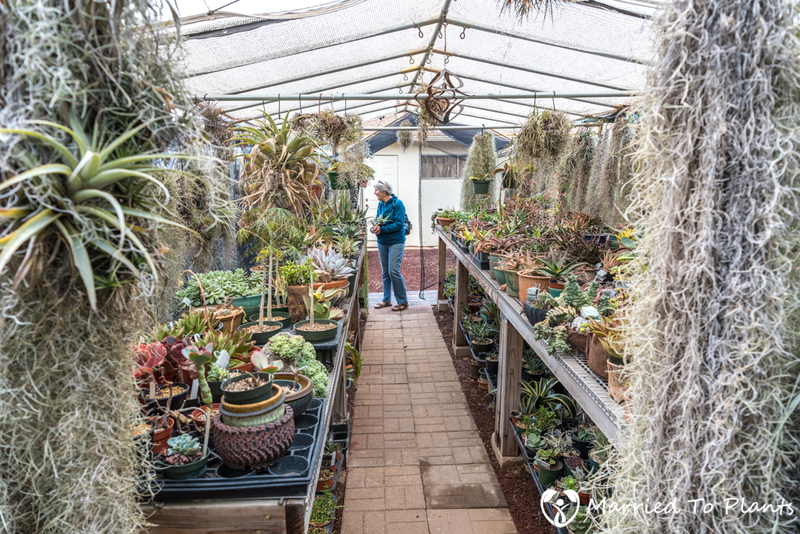 I have been told by a few that it provides a great opportunity to view some amazing gardens and meet some interesting people from the world of plants. 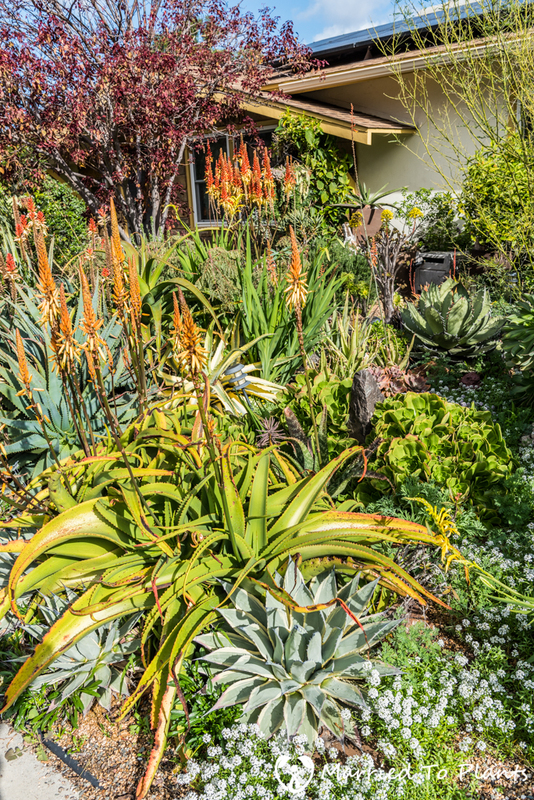 The first garden I would tour with the SDHS turned out to be a doozy. 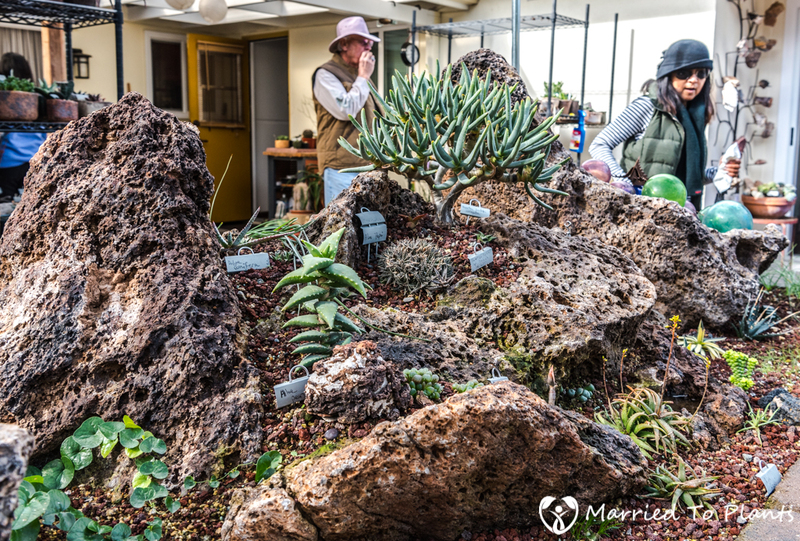 Dubbed a “Succulent Garden Party with Greg Starr,” it proved to be worth the membership dues alone. 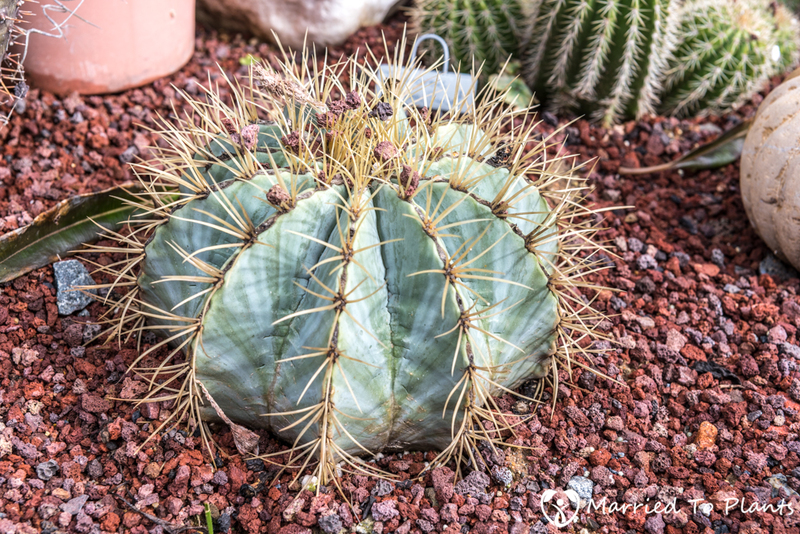 I have known about Greg Starr and Starr Nursery in Tucson for many years now. 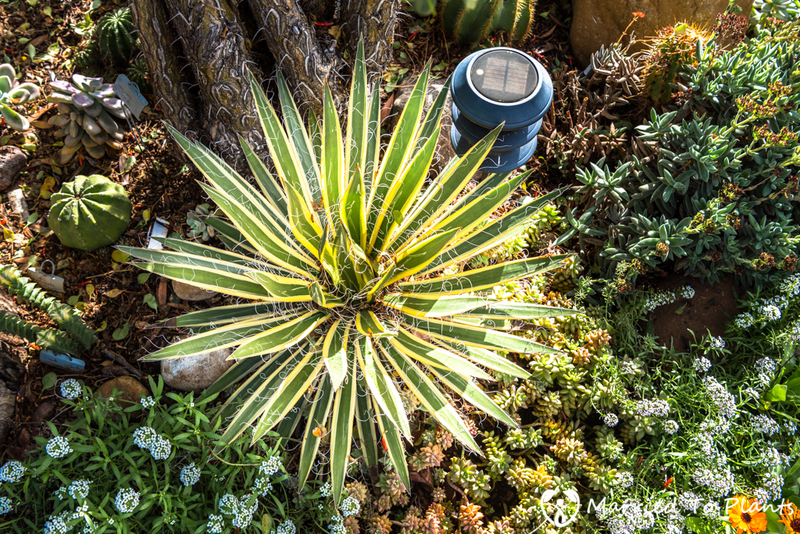 I even have a book he wrote called Agaves: Living Sculptures for Landscapes and Containers. 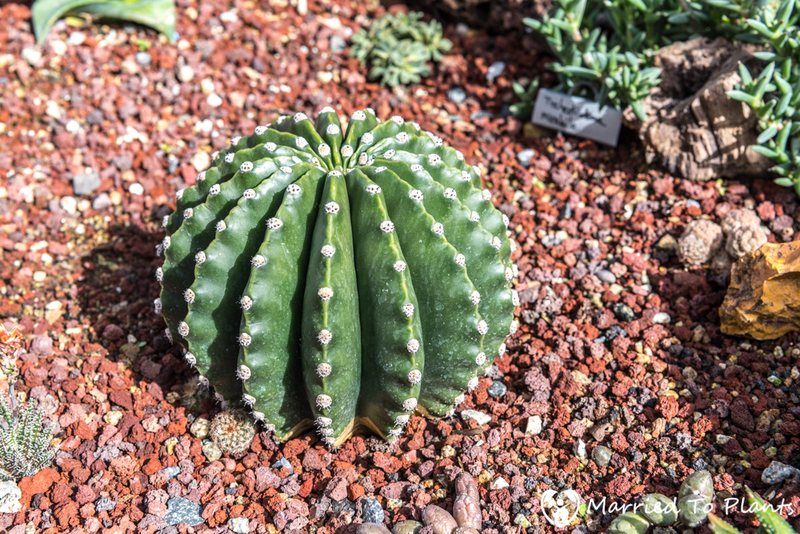 So I was looking forward to viewing his garden and succulent collection. 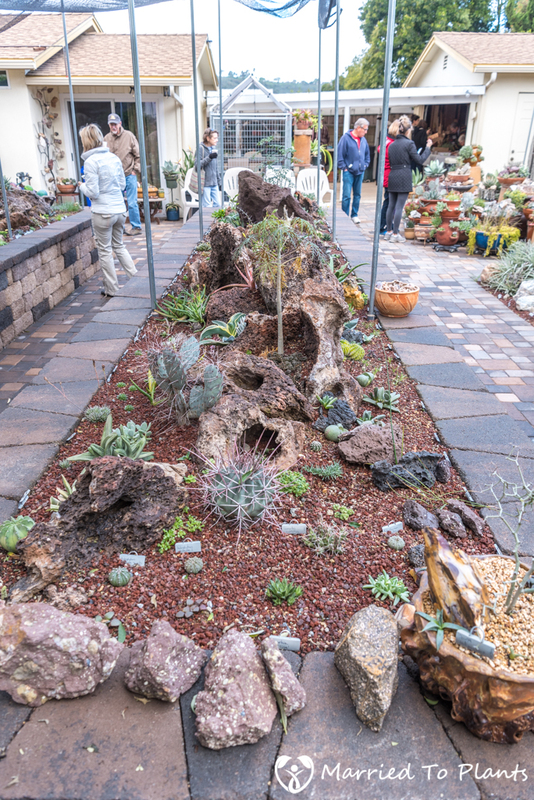 Before I start, I do need to point out that even though the event was called “Succulent Garden Party with Greg Starr,” it must be stated that the garden and collection is the work of Rick Bjorklund. 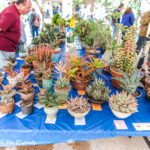 Perhaps the title would have been too long, but a more accurate description would have been “Succulent Garden Party with Greg Starr and Rick Bjorklund.” My first time meeting Rick was at this event, and I came away impressed with his passion for plants and his keen eye in regards to design. 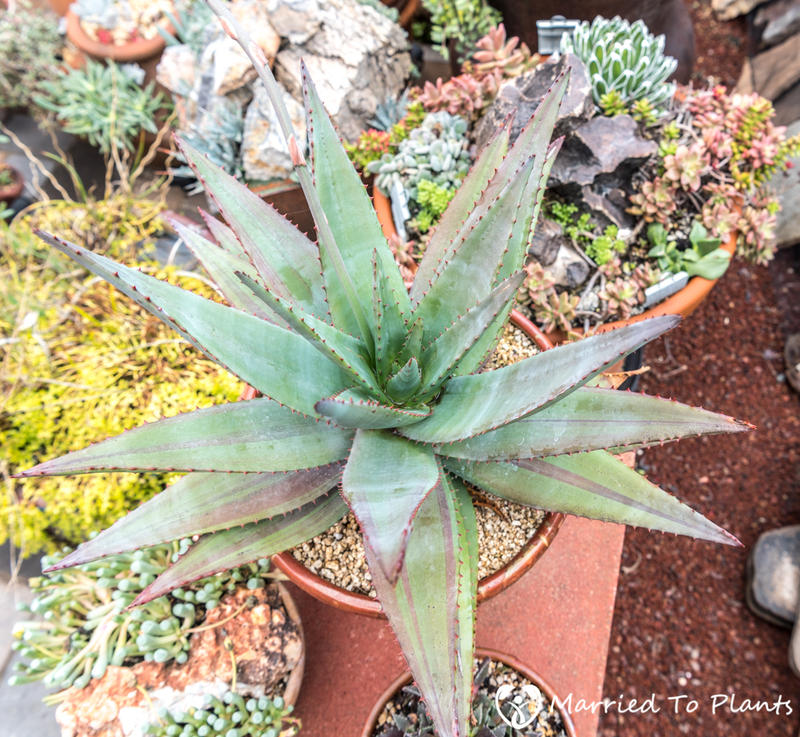 The weather for the Succulent Garden Party was up in the air a week out (no pun intended). Southern California was in an unusual period of rainy weather lasting for days. 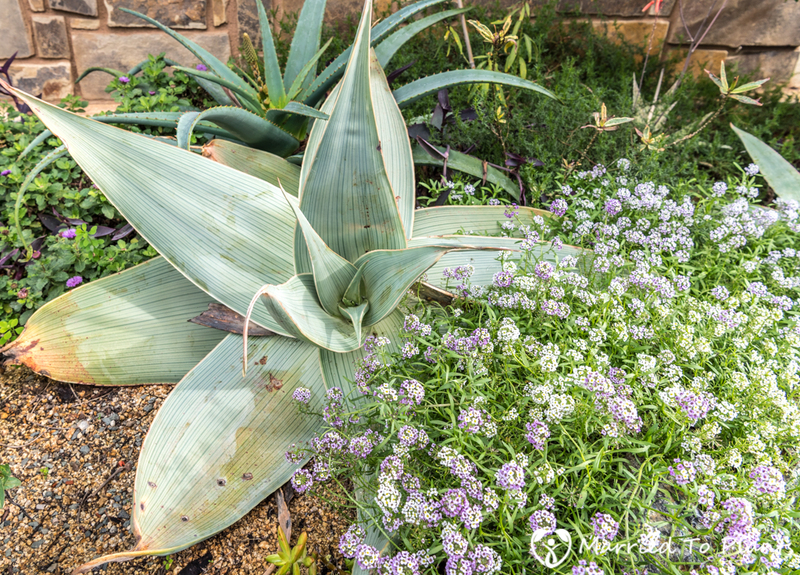 With luck, the rain stopped last Saturday to give everyone a chance to tour the garden dry. Sunday would see the return of rain. It wasn’t the best day for pictures, as the partly cloudy sky gave us periods of great lighting followed by bright sun. But you don’t look a gift horse in the mouth, as they say. It wasn’t raining. Even if it were, you wouldn’t need to check the address on the house to know you were where you were supposed to be. 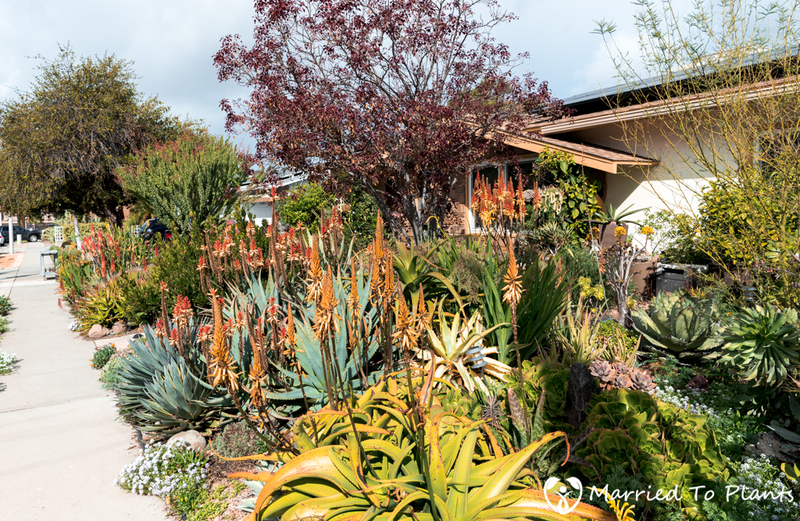 The entire front yard was jam-packed with succulents of every variety. All easily cohabiting as they they challenge each other for room. 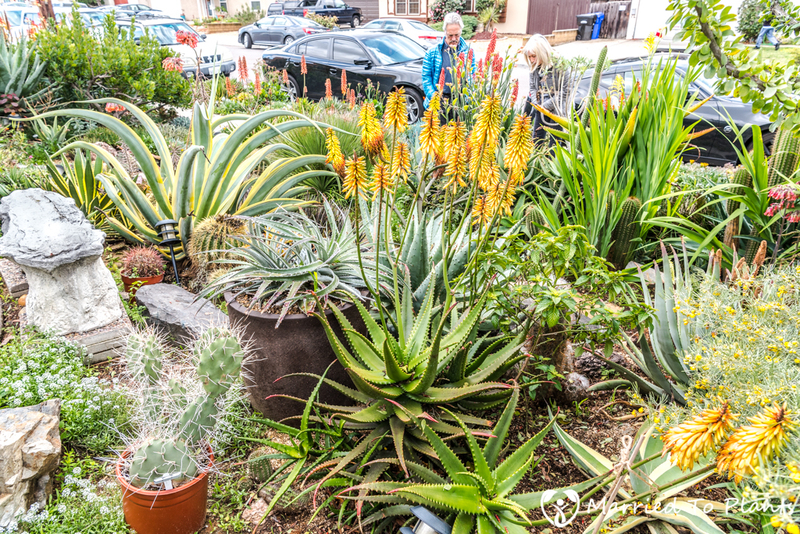 There was so much diversity that it became a bit of an Easter egg hunt for a plant enthusiast. You really needed to look everywhere or you were bound to miss something. 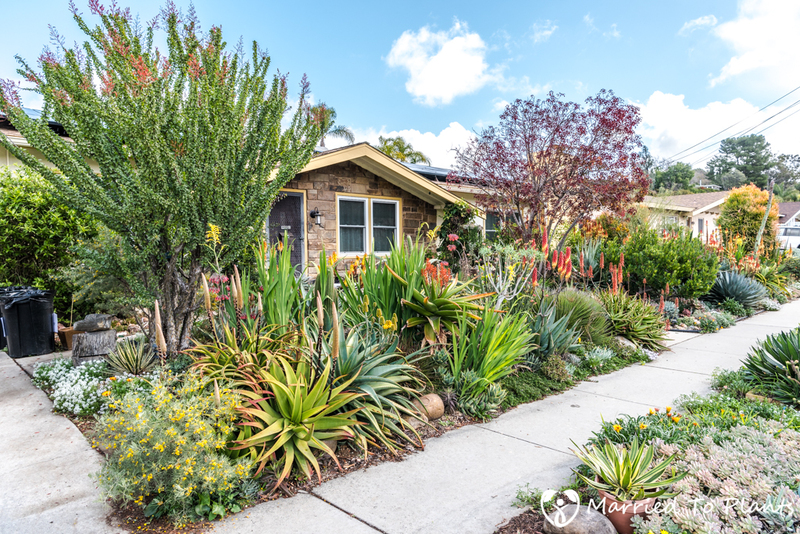 Rick managed to plant out the entire front yard and hopes of planting more would require removing something already in the garden. 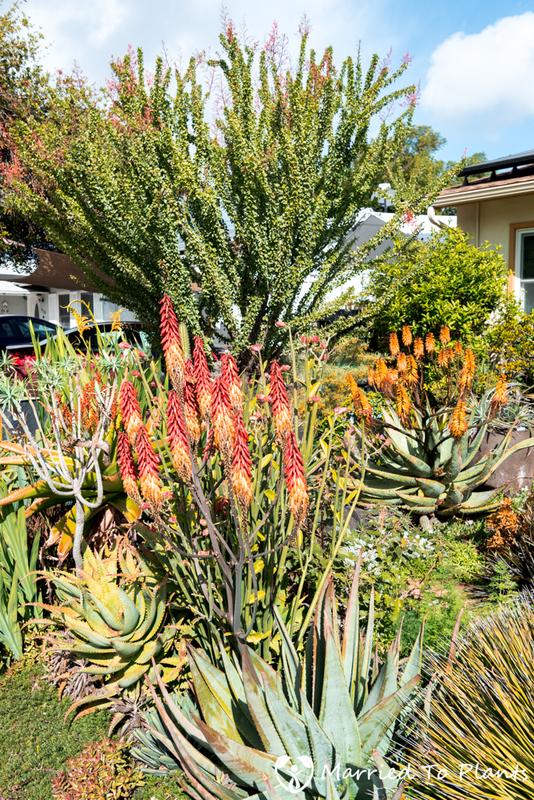 The front yard was beautifully planted out with an emphasis on aloes. Many of which were in flower this time of year. 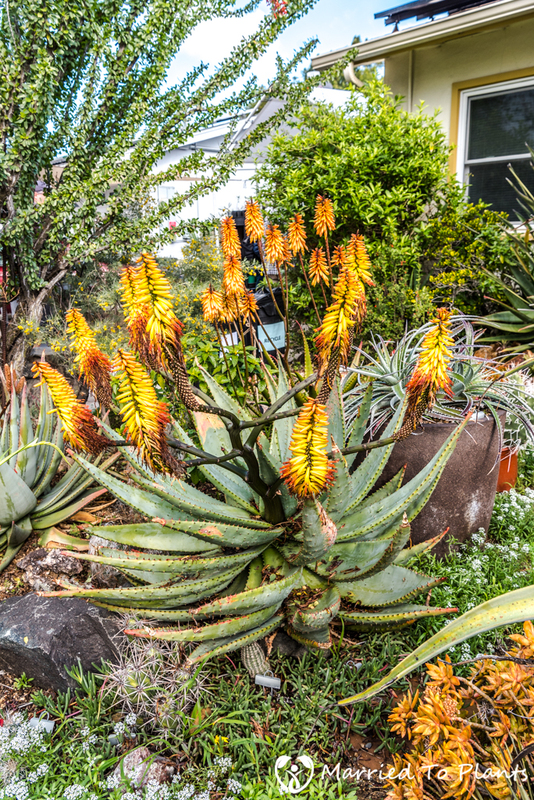 Aloe lutescens was in flower but what I liked about this planting were the Echeveria colorata ‘Mexican Giants’ at the base of the Aloe lutescens. 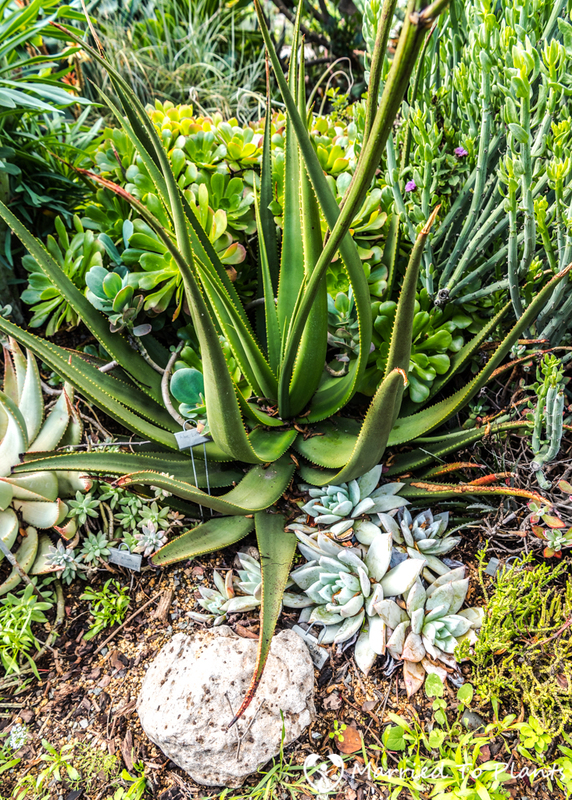 I still can’t figure out why I don’t have Aloe karasbergensis in my garden. 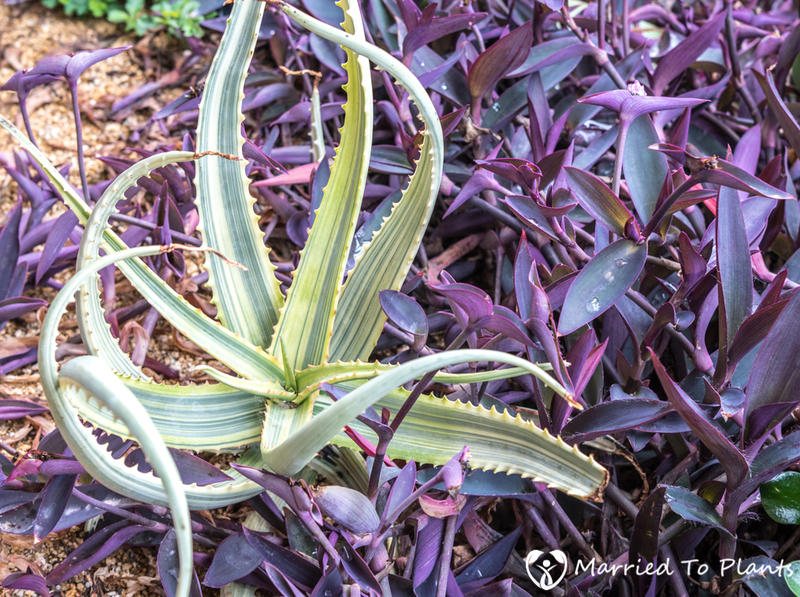 Love this aloe. 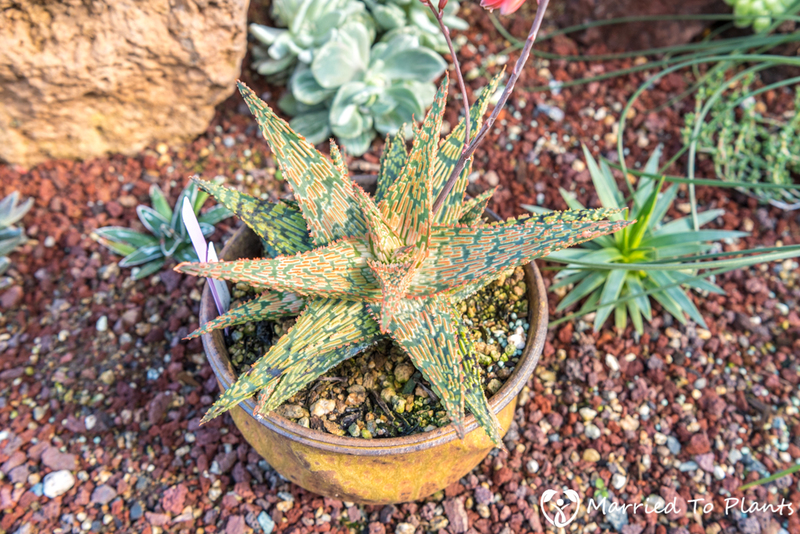 I think this is a variegated Aloe camperi. Great contrast planting with the Purple Queen (Tradescantia pallida). 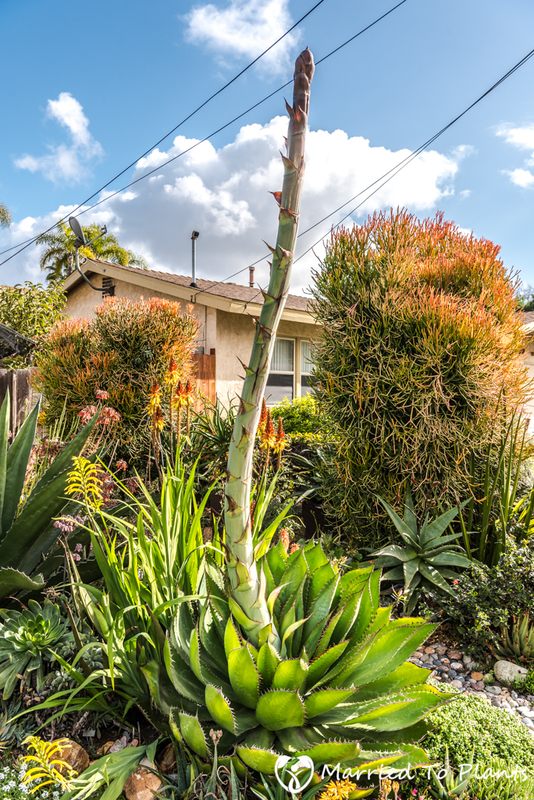 Many agaves were planted in the front yard as well. 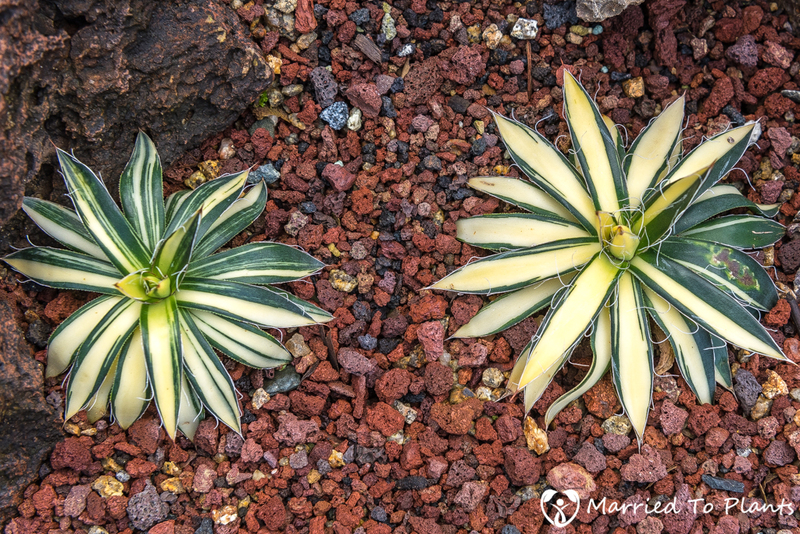 I did a blog post a while back on my favorite agave, Agave ‘Blue Glow.’ Here is a regular Agave ‘Blue Glow’ on the left and Agave ‘Sun Glow’ on the right. 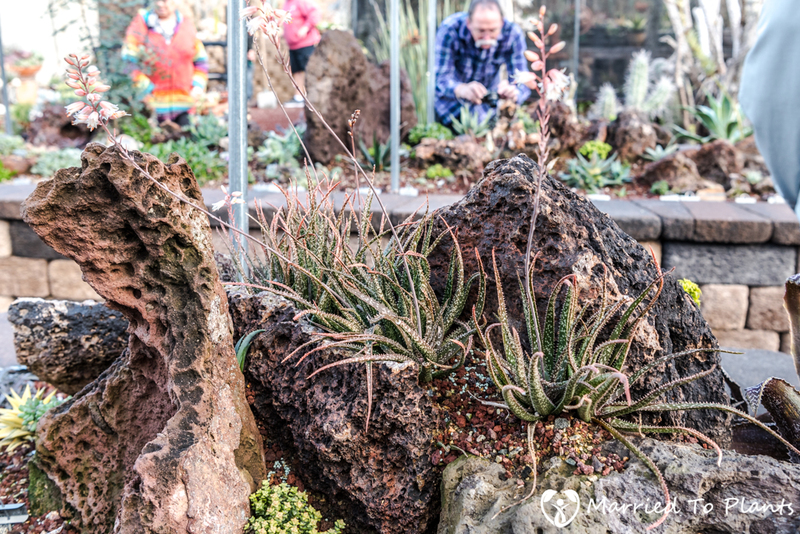 Rick also had a flowering Agave bovicornuta. You don’t see this every day. There are two trees planted in the front yard. 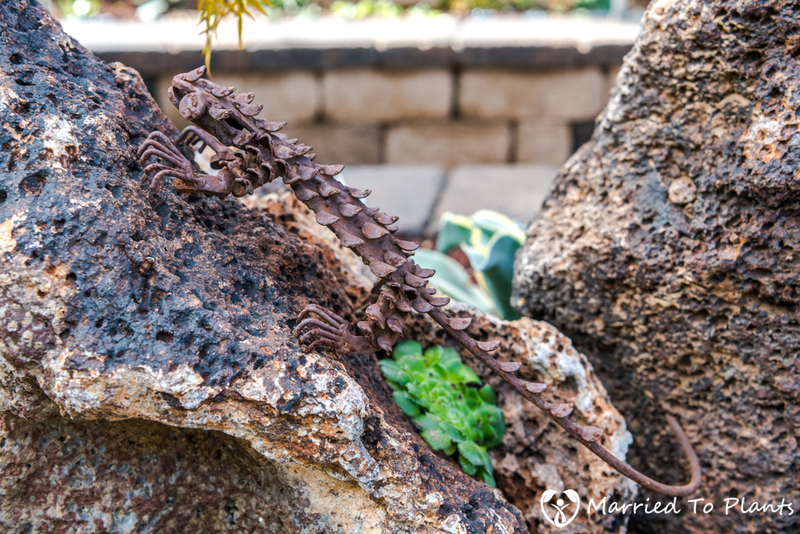 One really stands out in the pictures and is a focal point in the garden. Thanks to all the rain, Rick’s Fouquieria diguetii is leafed out and flowering. 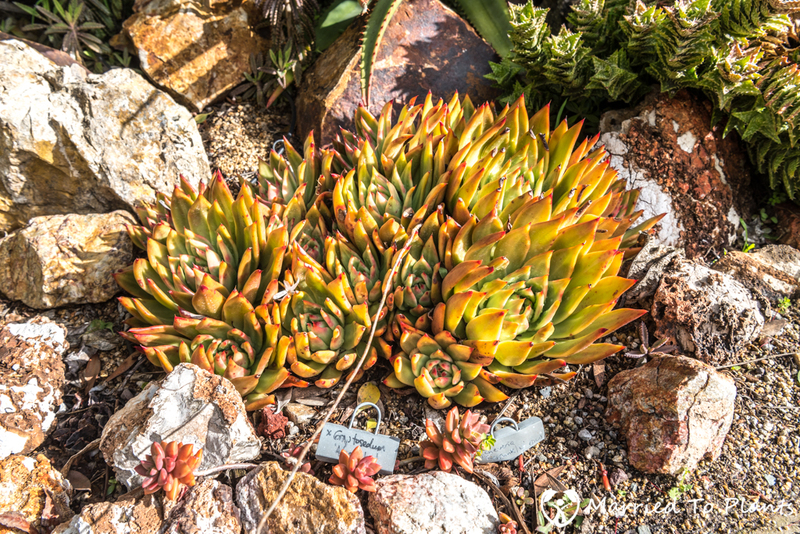 Great coloration on this unknown Echeveria agavoides type. 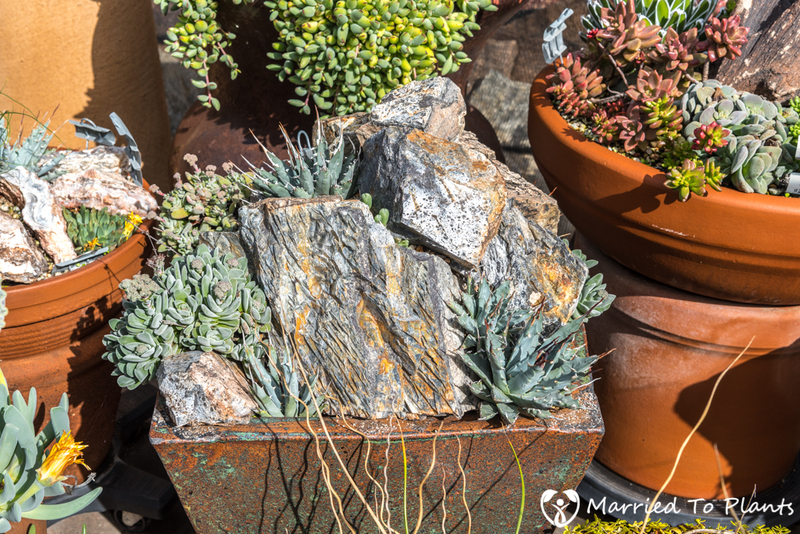 The garden does a wonderful job of integrating pottery and rocks. 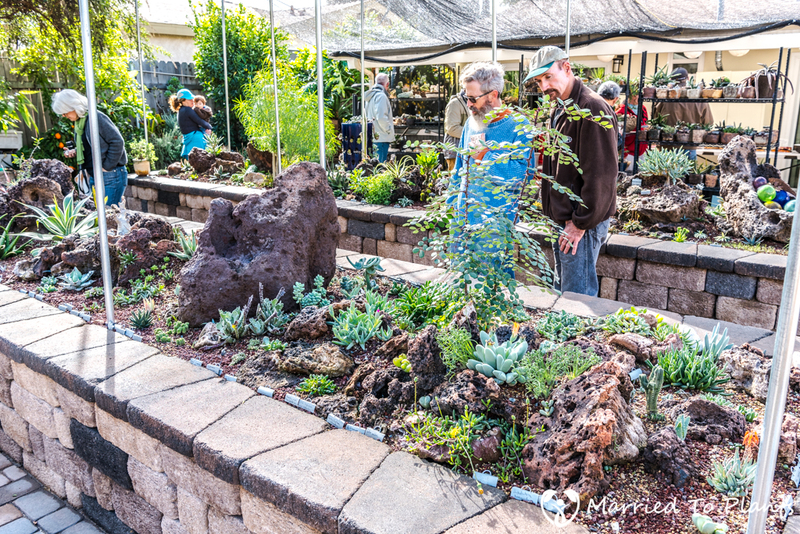 This is something I am learning to do as well, and touring Greg and Rick’s garden gave me some fresh ideas. After spending a good amount of time touring the front yard, I made my way towards the back. I had already been alerted to the splendor of the backyard from garden guests that were just there. 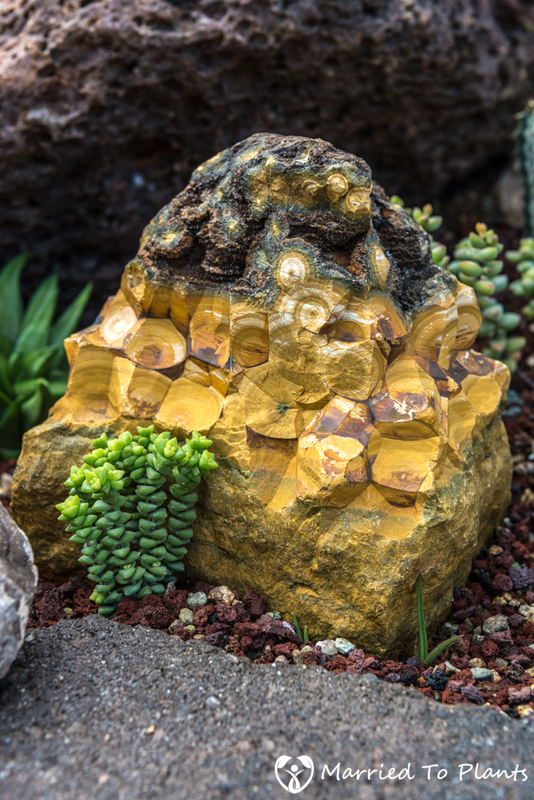 The Succulent Garden Party was about to get even better. Expecting the same design elements in the back, I was pleasantly surprised to see something altogether different. 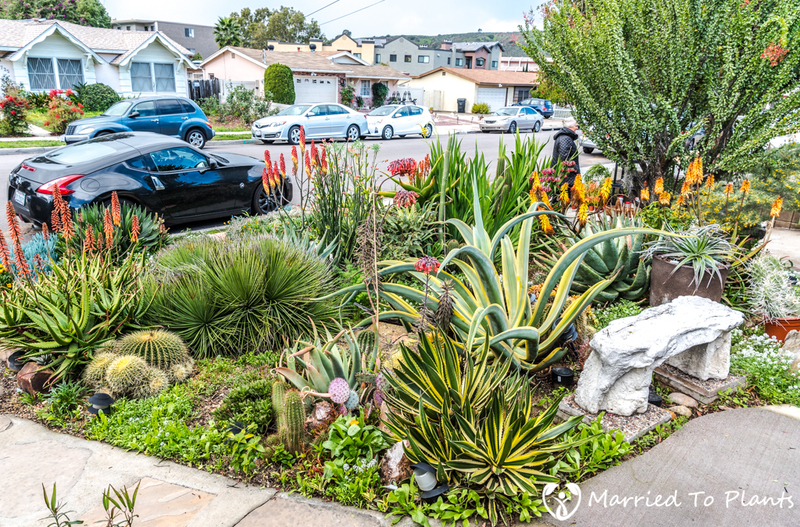 The first thing you saw once you passed the garage was a impressive potted plant display. 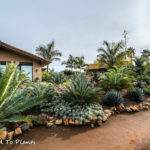 Each individual pot was beautifully planted out with aloes, agaves and other succulents and accented with colorful rocks. These next two photos give a great example of how detailed some of the designs were. 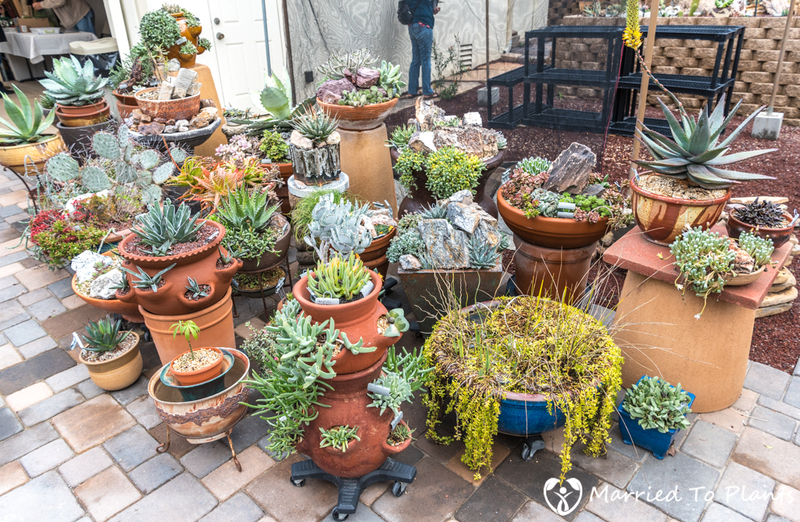 Each of these unique pots was enjoyable to look at. I found myself coming back here often and finding something new each time. 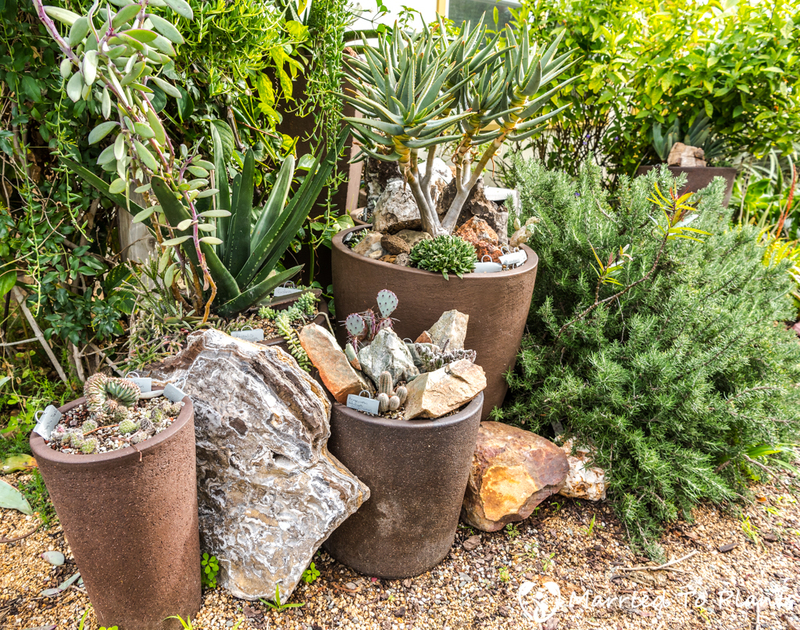 If you look at the middle right of the photographs showing all the pots above, you will see an oddly striped aloe. It is green with red-colored striping on older leaves. I have never seen this before, so I asked Rick about it. 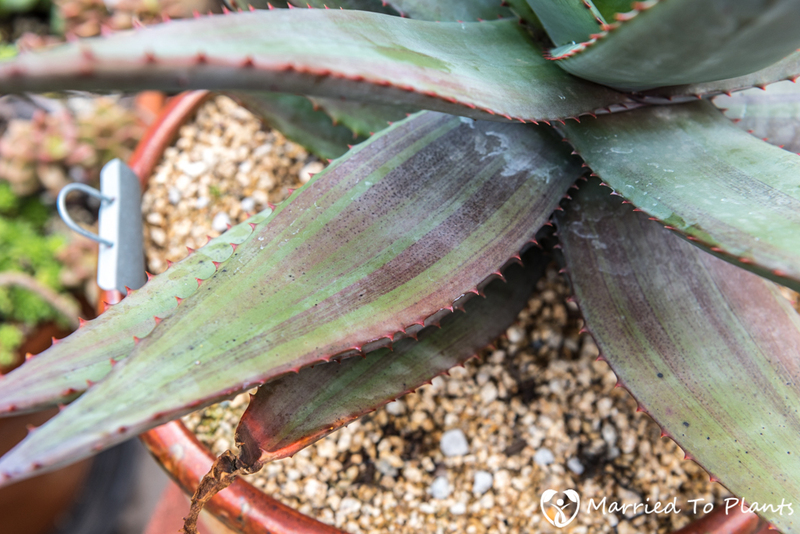 Apparently some aloe hybrids will display this characteristic where the stress on the aloe only shows up on part of the leaf. 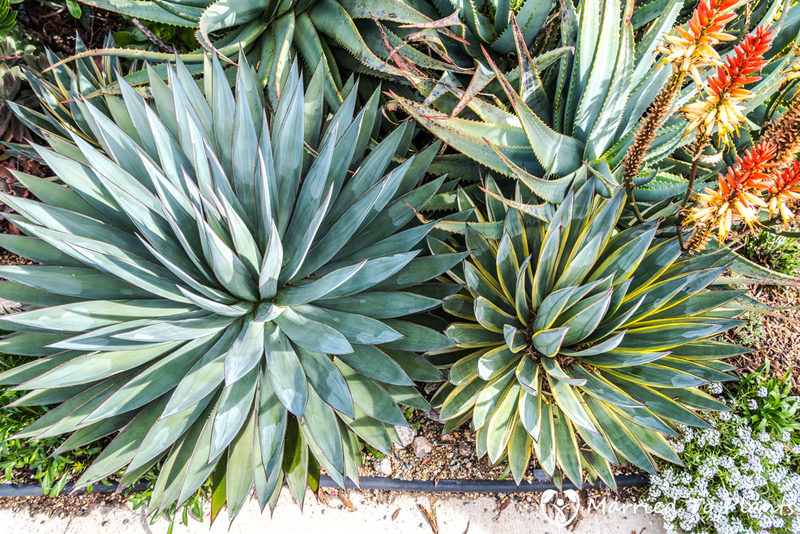 This plant below is an Aloe conifera x ferox. What stood out most once I saw the backyard were the two raised garden beds. Each was a planted work of art. 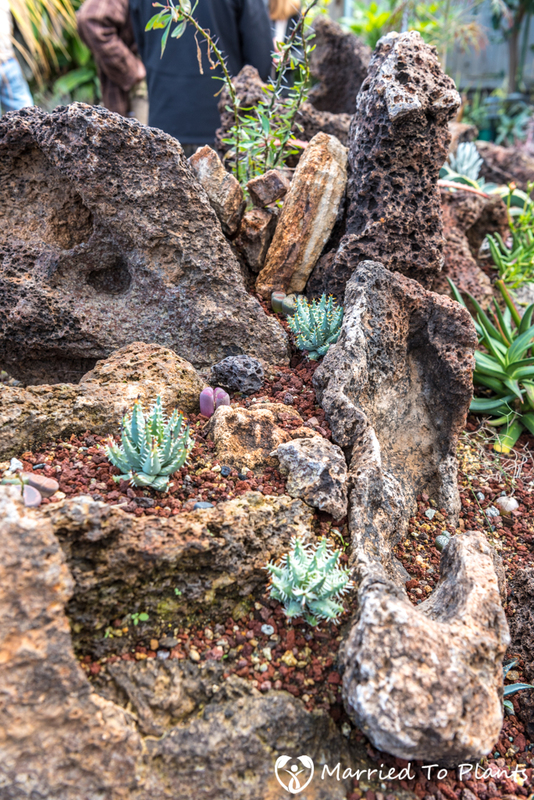 One problem with many of the unusual succulents is that they are not large plants. So when you put them in the ground, they easily get lost in the landscape. 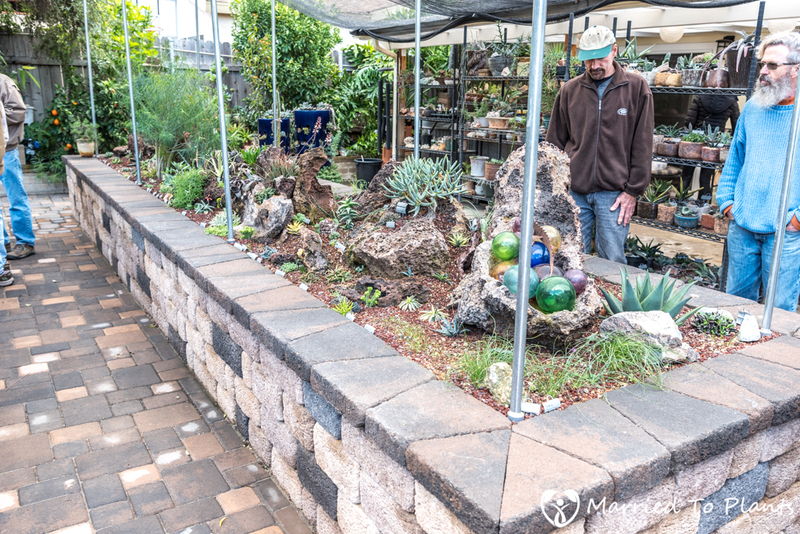 These raised beds provided an excellent way to display small plants that usually only do well in a micro-garden. Apparently the spot where these beds reside was once where a pool and pond were. Here is the first raised bed from the front and the back. 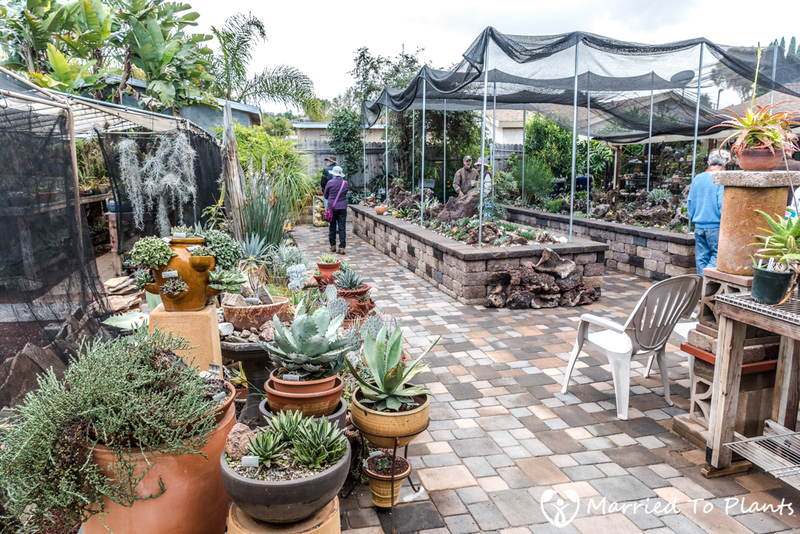 The raised beds were perfect for easier viewing and photography of the impressive collection of small succulents planted in them. 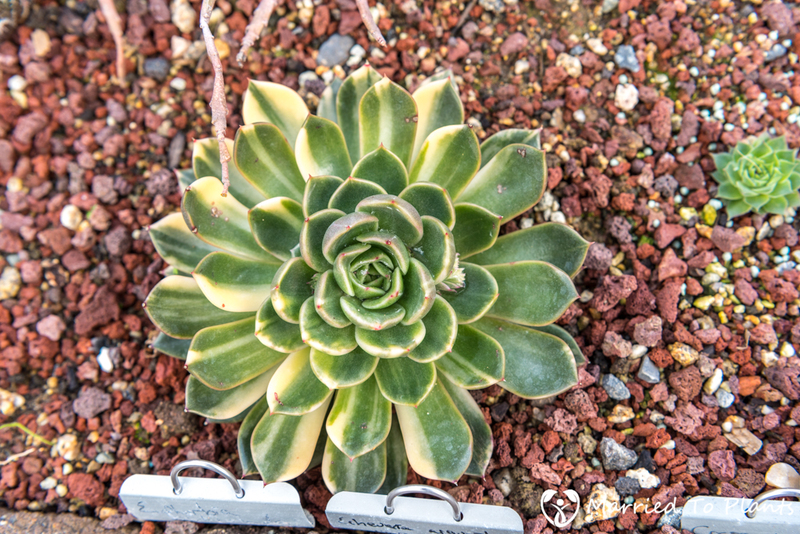 As an added bonus, almost every plant had a label. A great level of detail was on full display. 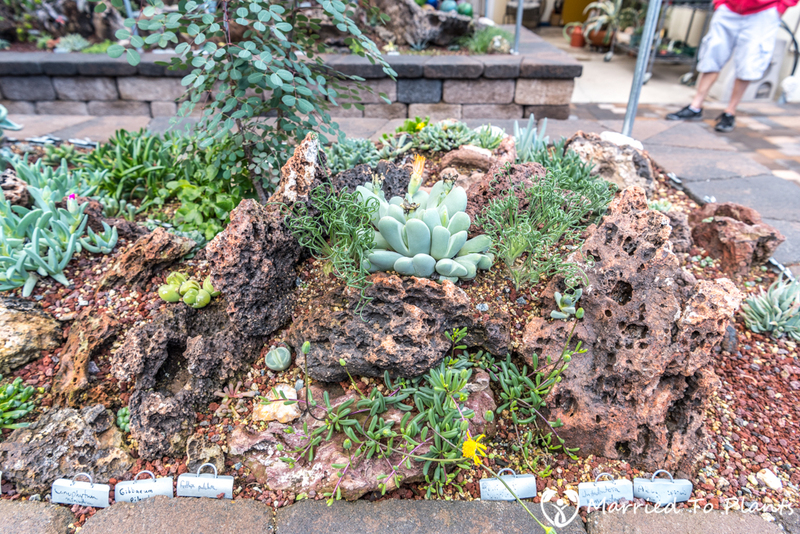 The base rocks were perfect for this type of planting and were complimented with other small rocks and gravel, which made the beds look like a natural scene you would find in habitat. 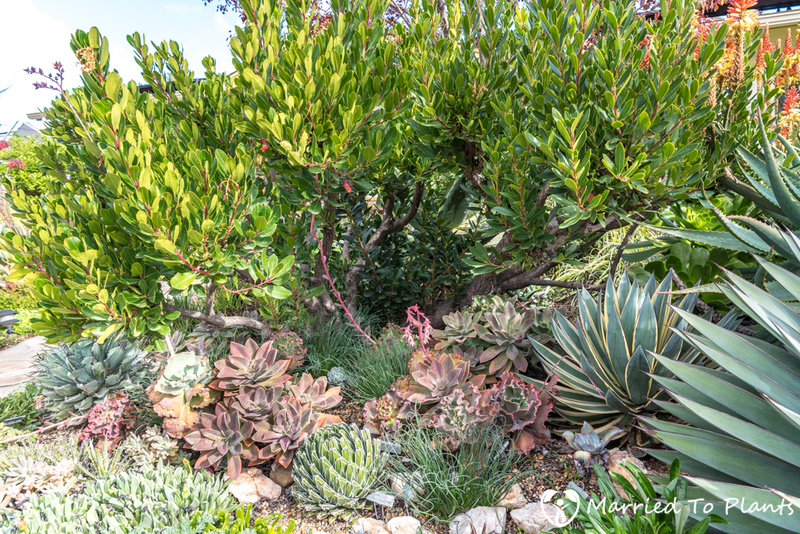 I probably took 100 photos of the raised beds and the succulents planted in them. No way to add most in this blog post, so I will just pick out a few. 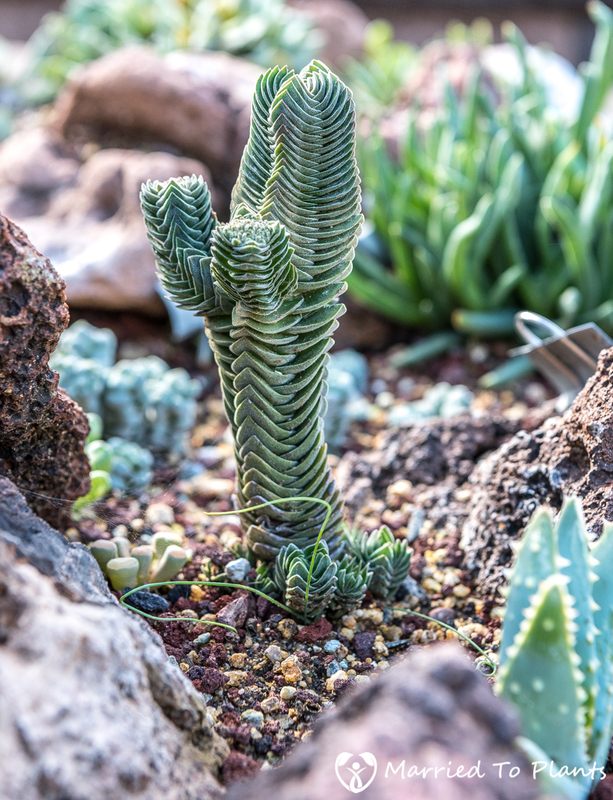 Starting with this Crassula ‘Buddha’s Temple’ that reminded me on a miniature scale of a Saguaro Cactus. 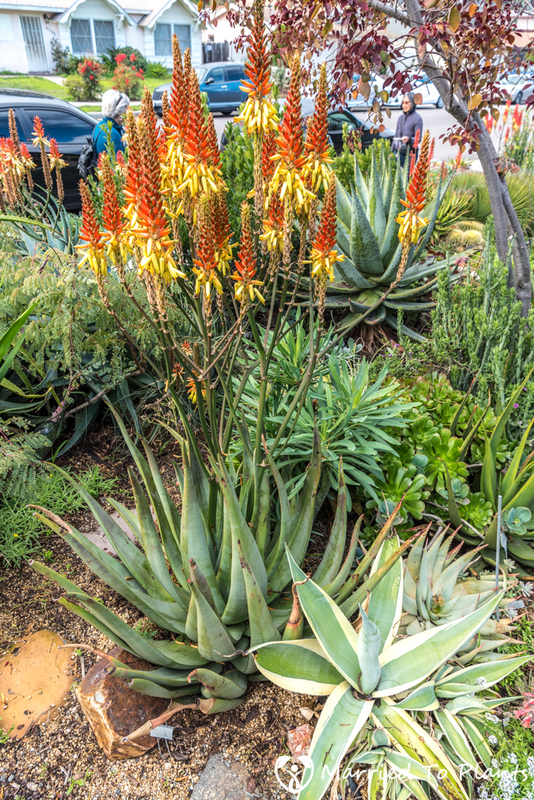 I really liked this unknown Aloe hybrid. It had attractive bright-pink flowers. 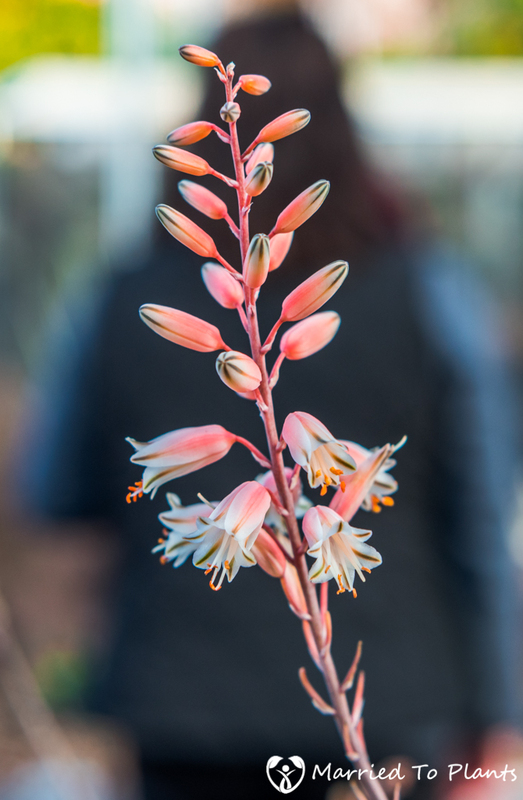 A Kelly Griffin hybrid called Aloe ‘Sunrise’ waiting to be planted. 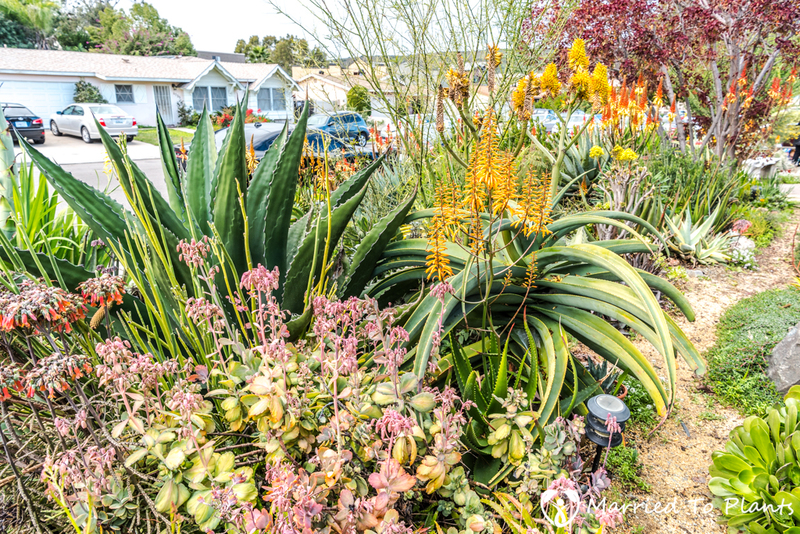 Even a bromeliad made it in the plantings. 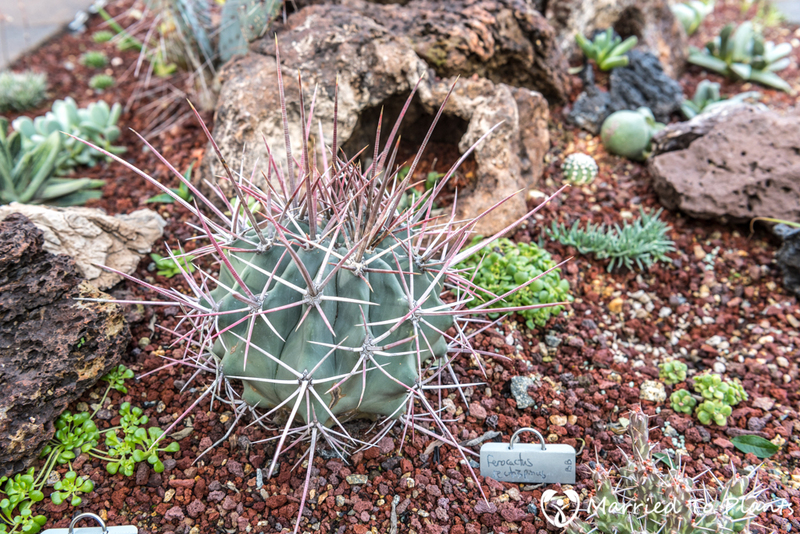 This is a Orthophytum gurkenii. 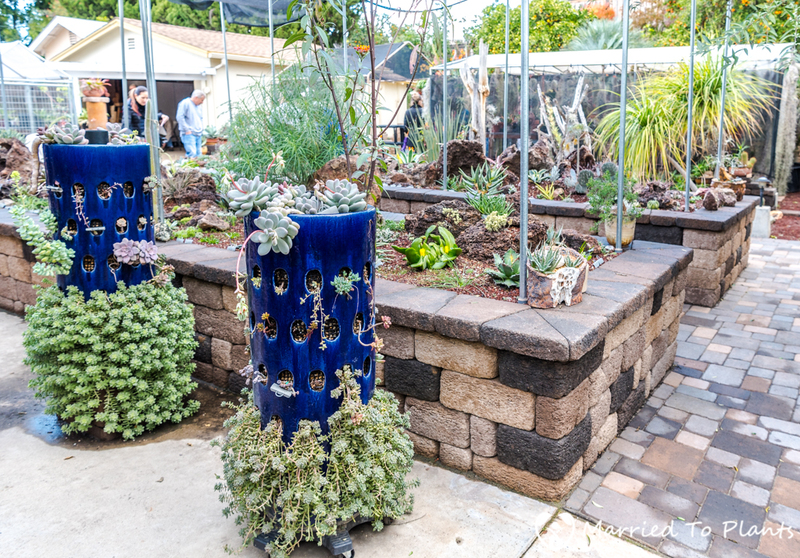 One last look back at the raised beds complemented by some unique blue pots. 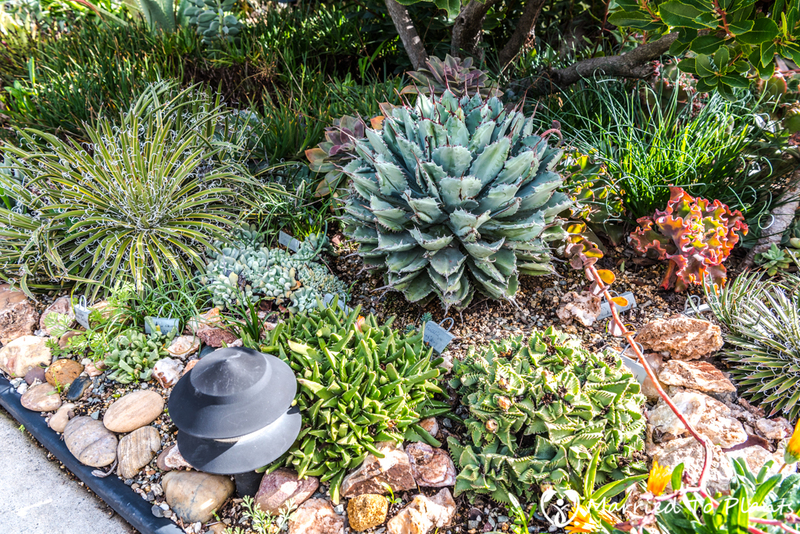 The guardian of the backyard with pot of Echeveria agavoides ‘Ebony’ hybrids on his head. 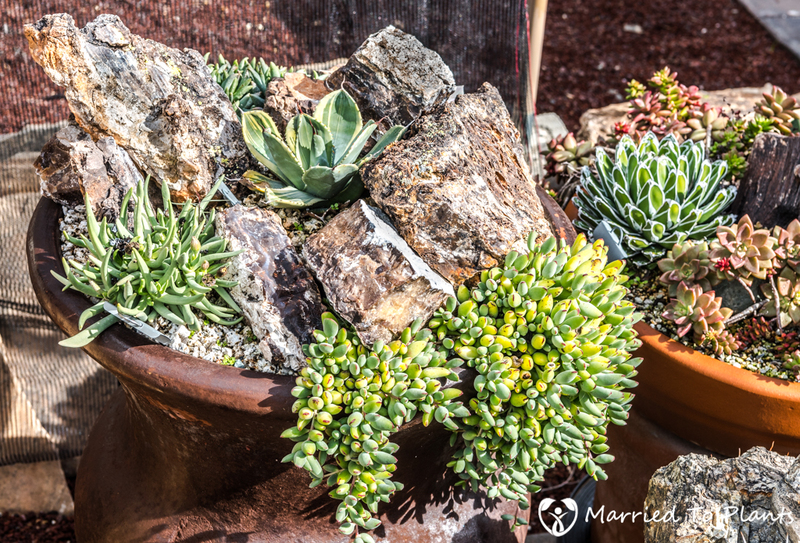 Continuing with my exploration in the garden of Rick Bjorklund led me to this small pot plant display. 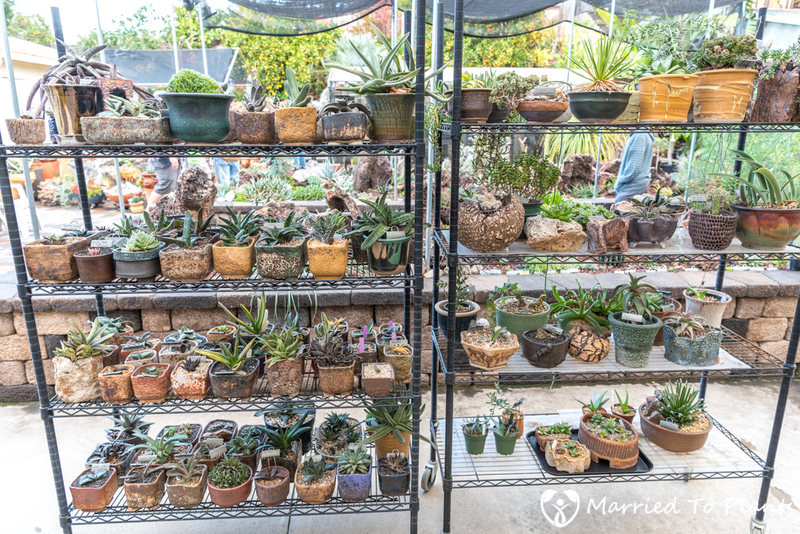 This wasn’t only a display of plants, but of beautiful pottery as well. 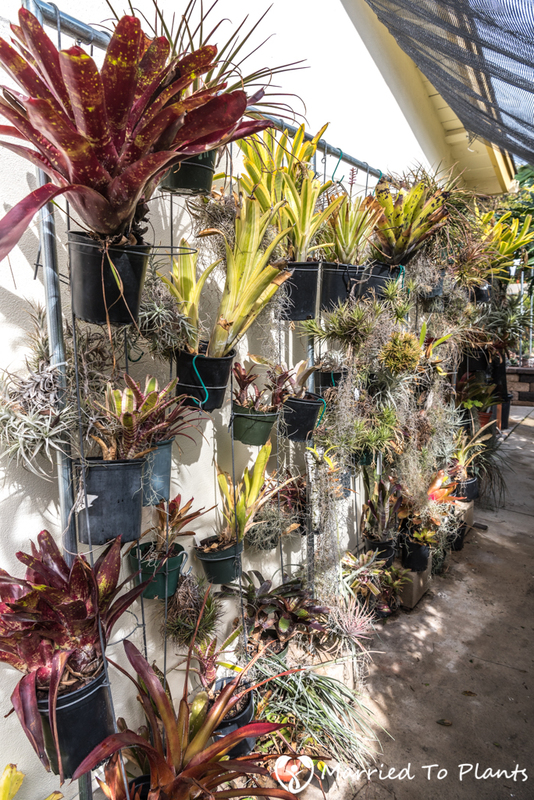 If you didn’t make your way to the side yard, you would have missed the bromeliad collection. 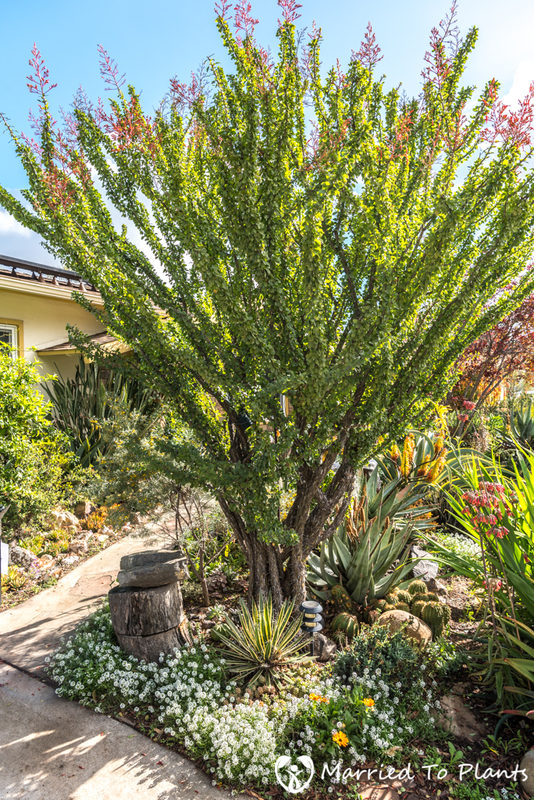 Before making your way up to the hillside on the property, you pass the shade house. 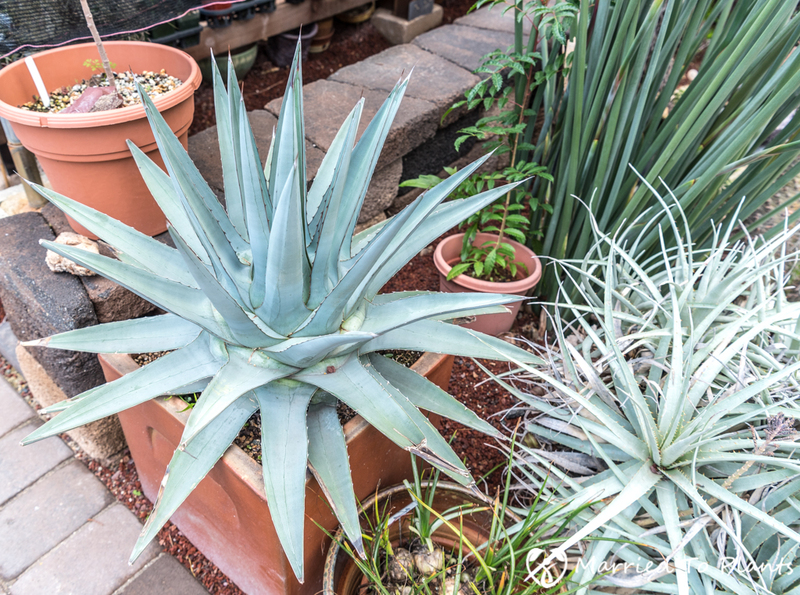 In the photo above you can see an attractive agave in a square orange pot. 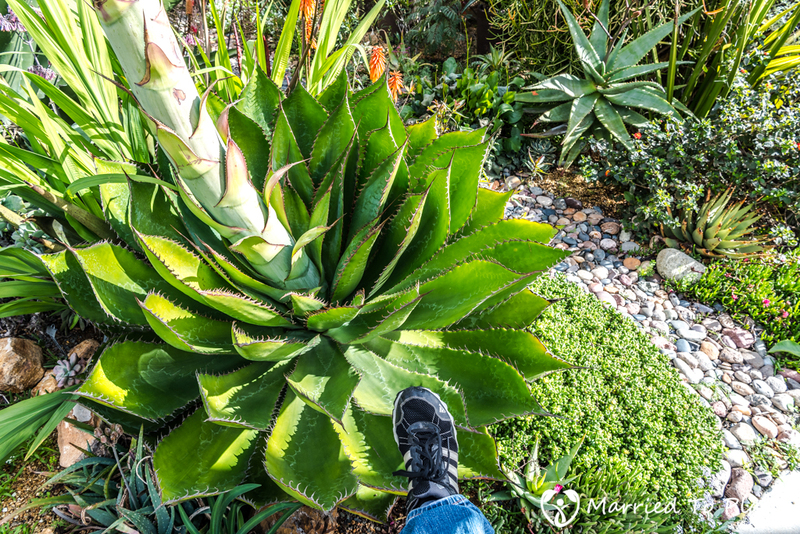 It is an Agave x pumila and the largest I have seen in person. Agave x pumila tends to be a slow grower in pots, so this one is pretty old. 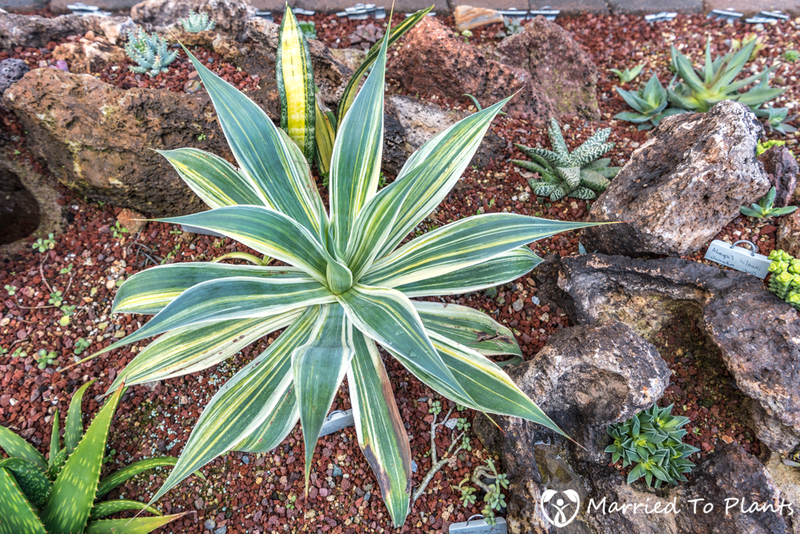 It no longer has any of the juvenile leaves that make these so desirable as small agaves. 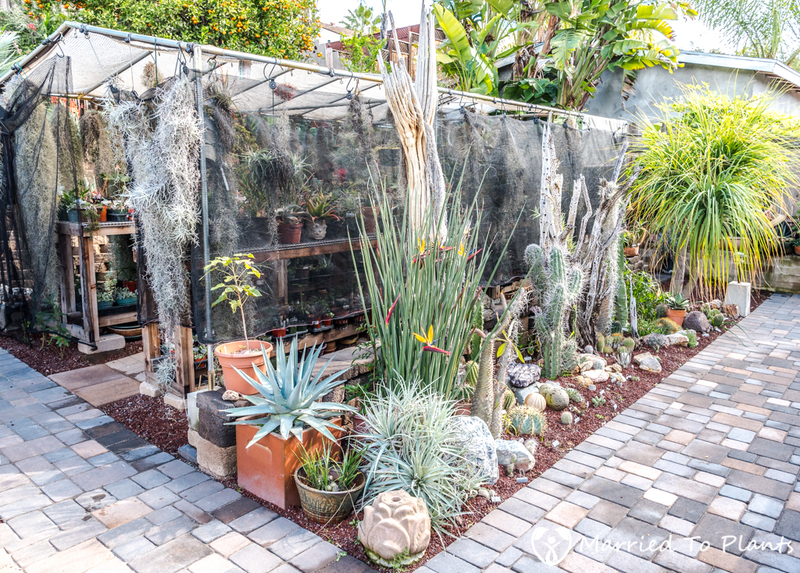 Inside the shade house. I still can’t believe the amount of plants on the property. The hillside was terraced – to maximize plantings, of course. The tree in the center is an old Tangerine Tree. You don’t see these in gardens much these days. My grandmother had one in her backyard, so it brought back memories. Also, is that a palm tree I see? Yes it was. Chamaerops cerifera to be exact. 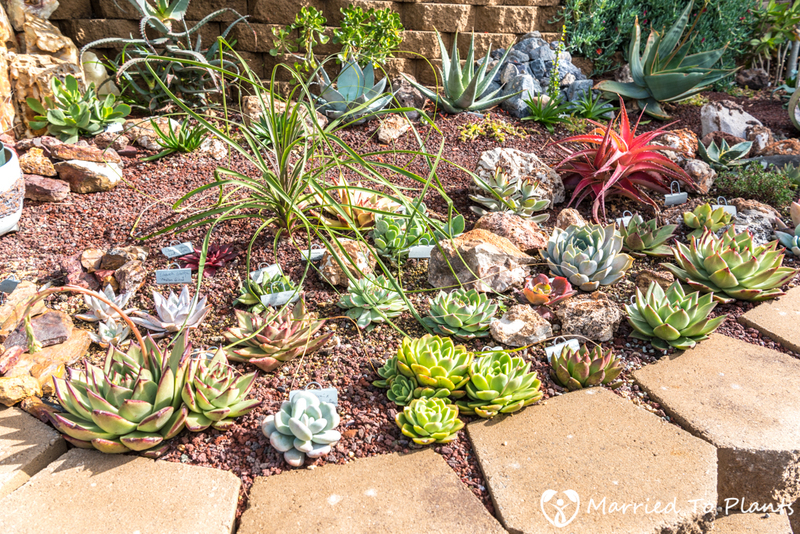 A nice Echeveria collection with agaves and aloes in the back. 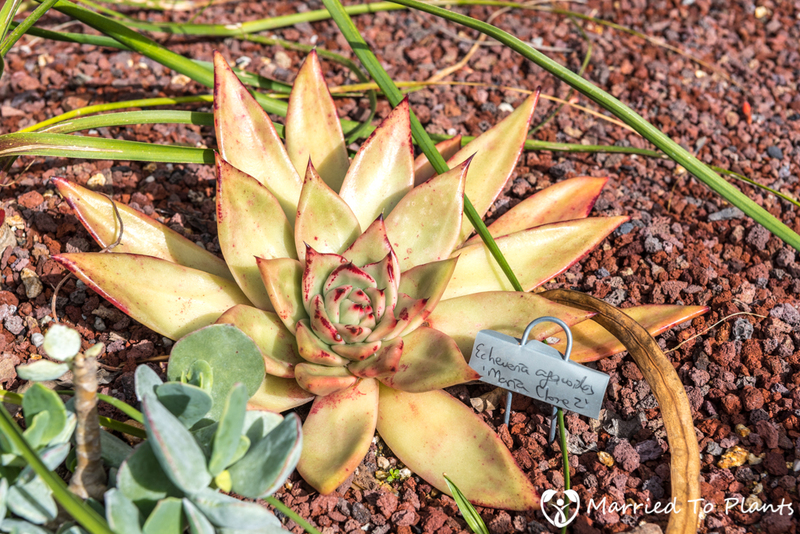 My favorite was this Echeveria agavoides ‘Maria Clone 2.’ Great color. The view looking down from the hillside of the backyard. 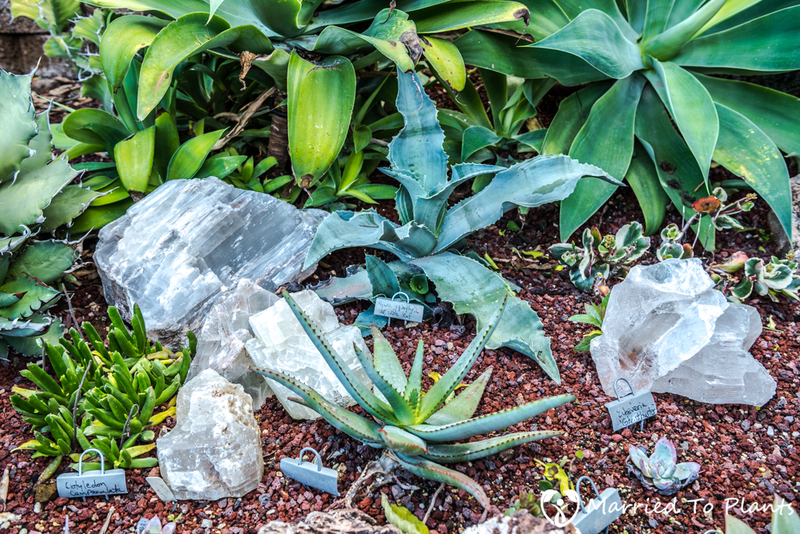 Yes it was a Succulent Garden Party, but I couldn’t help but admire the rock collection Rick had as well. 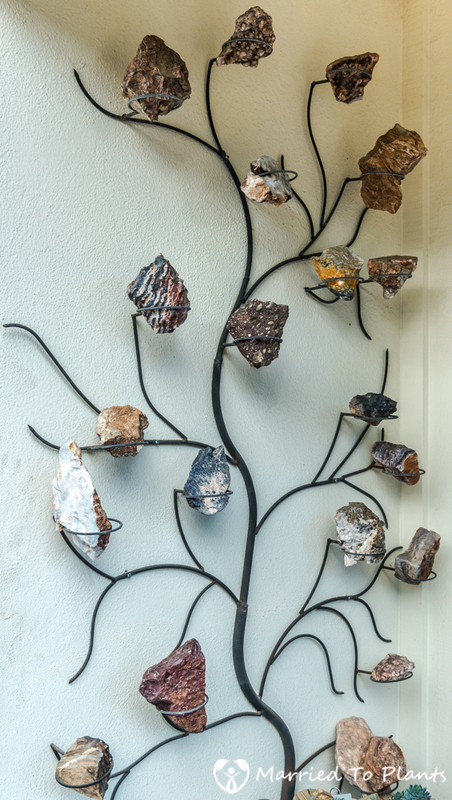 With displays like this below, I would have bet money Rick was a geologist. I would have lost. 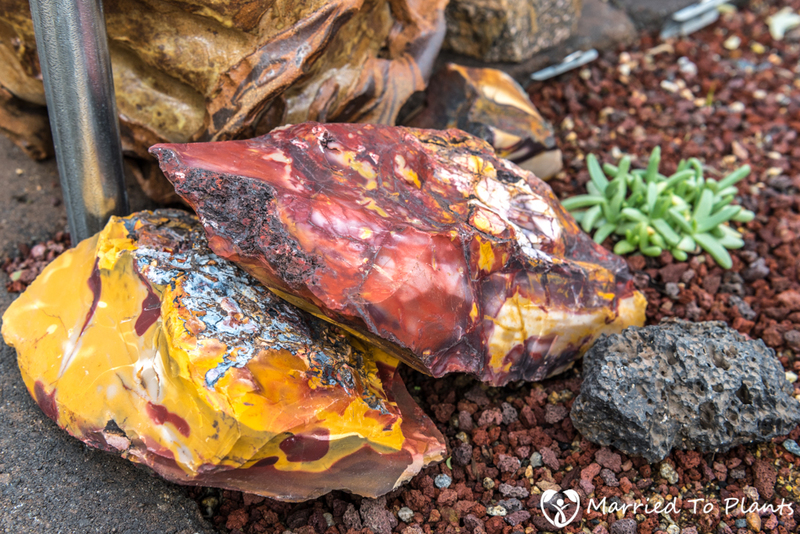 Some of my favorite rocks I saw. 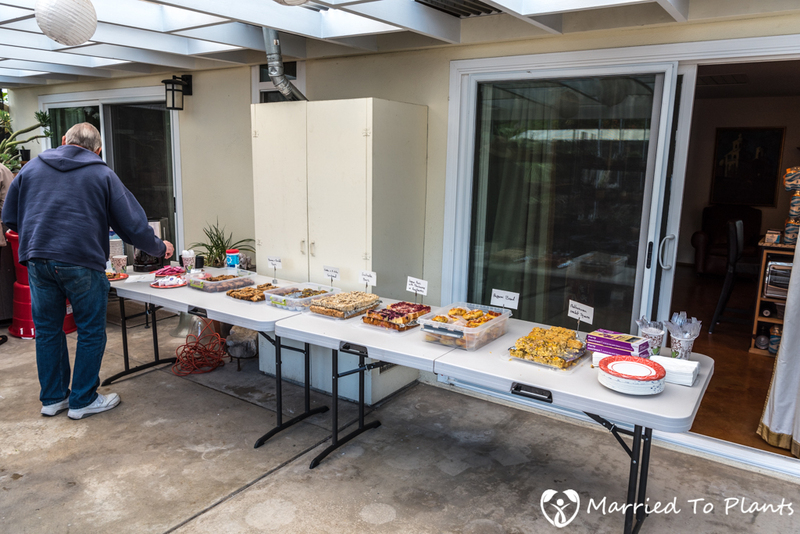 It’s not a Succulent Garden Party without food and drink. 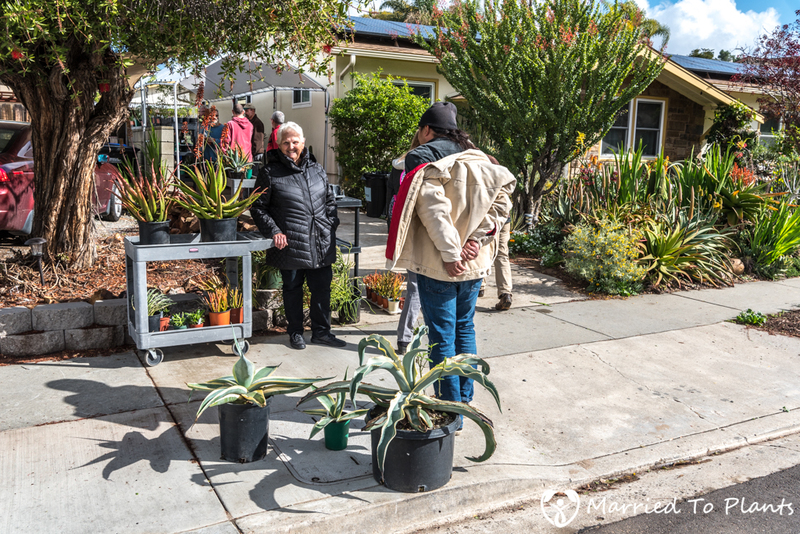 In addition to the garden tour, Greg Starr was also visiting and selling plants. 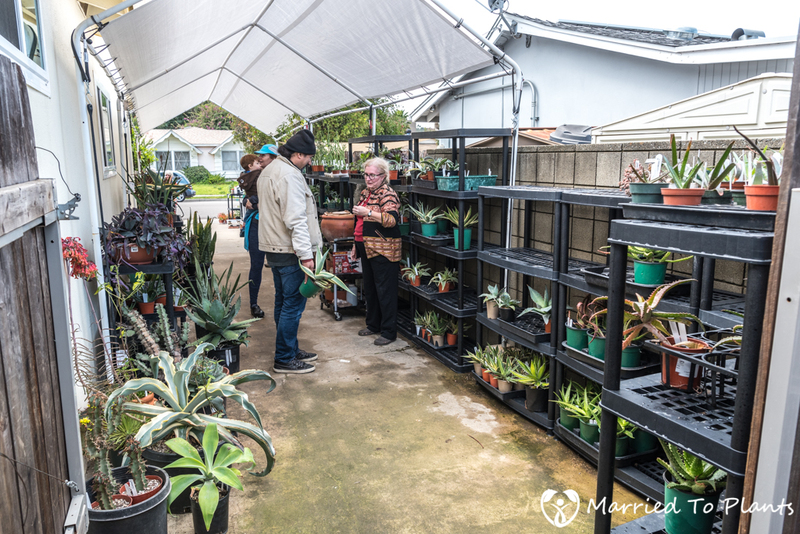 The plant sale was very popular. 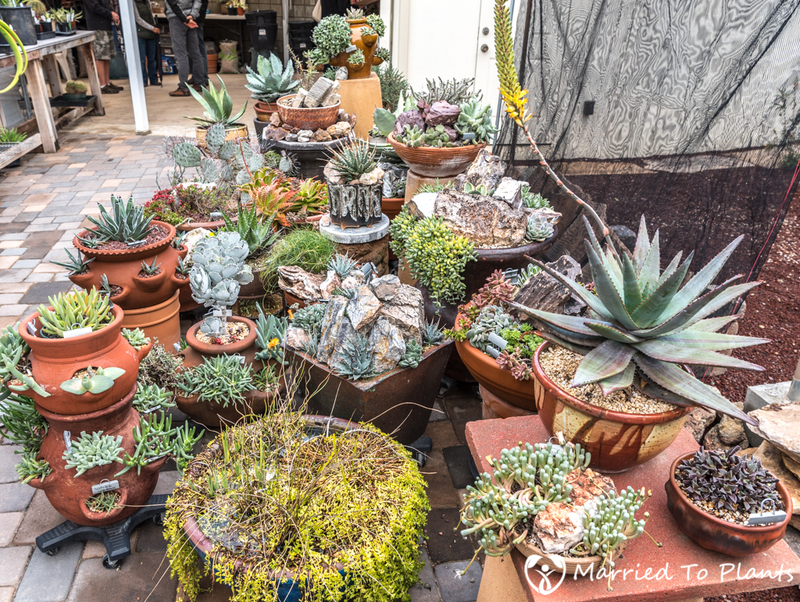 The Succulent Garden Party started at 10 and I arrived around 10:15. 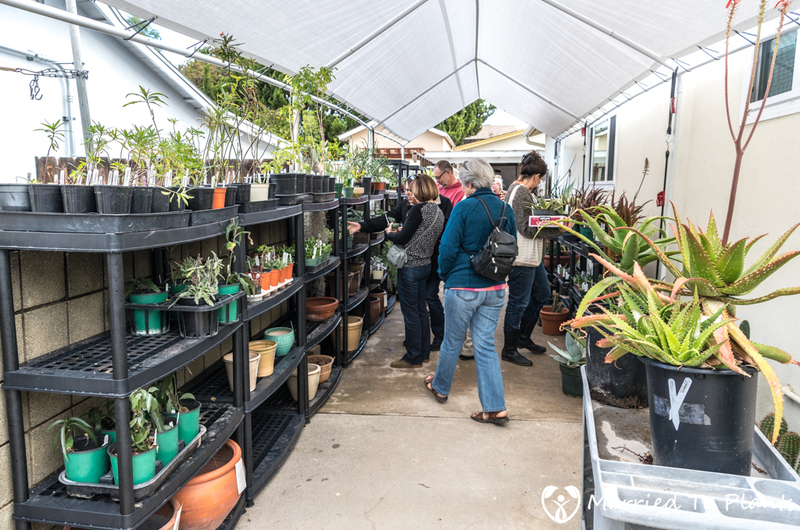 There was already a line formed to pay for plants being purchased by the time I arrived. You snooze, you lose. A few happy shoppers waiting for their significant others to arrive with the car so they can load up the loot. All good things must come to an end. This is a good place to close out this post. 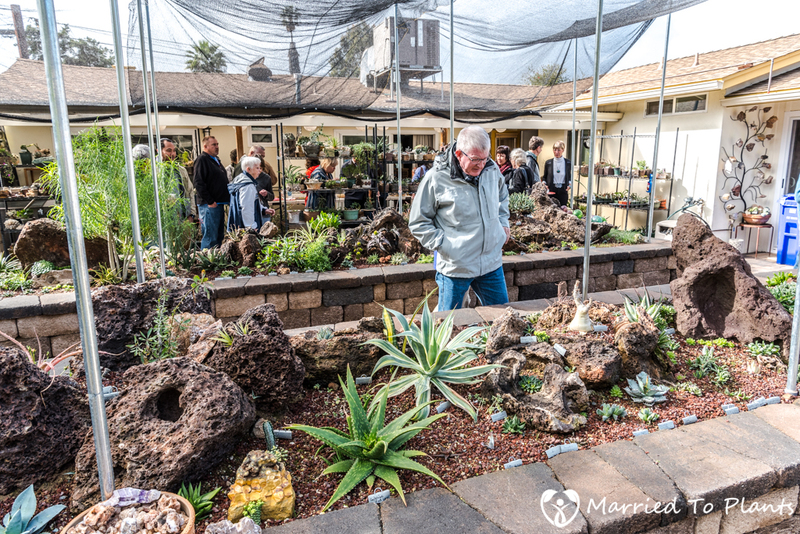 I would like to thank the San Diego Horticultural Society for putting on this event and allowing me to visit a garden I might not have had the chance to see on my own. Woooowwwwwwwwww! You know how to party! 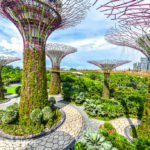 Another incredible garden. Thank you so much for sharing it. 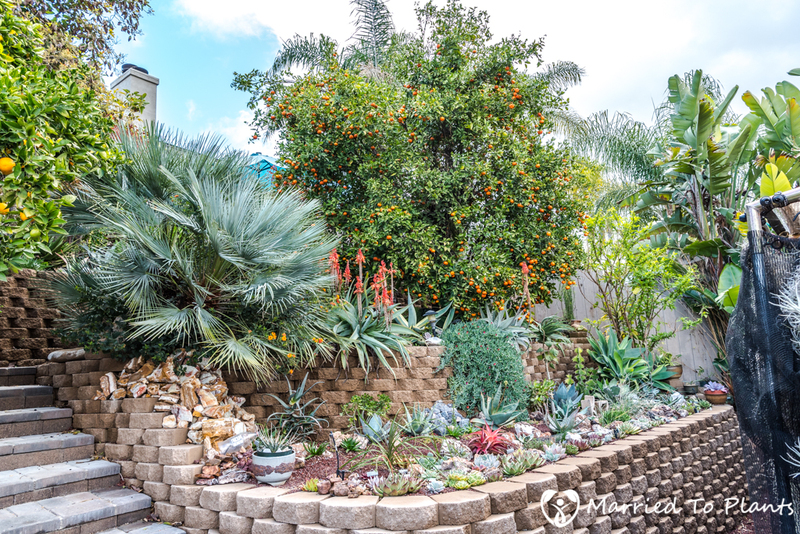 Impressive how Rick is able to fit in so many beautiful plants into a relatively small space. 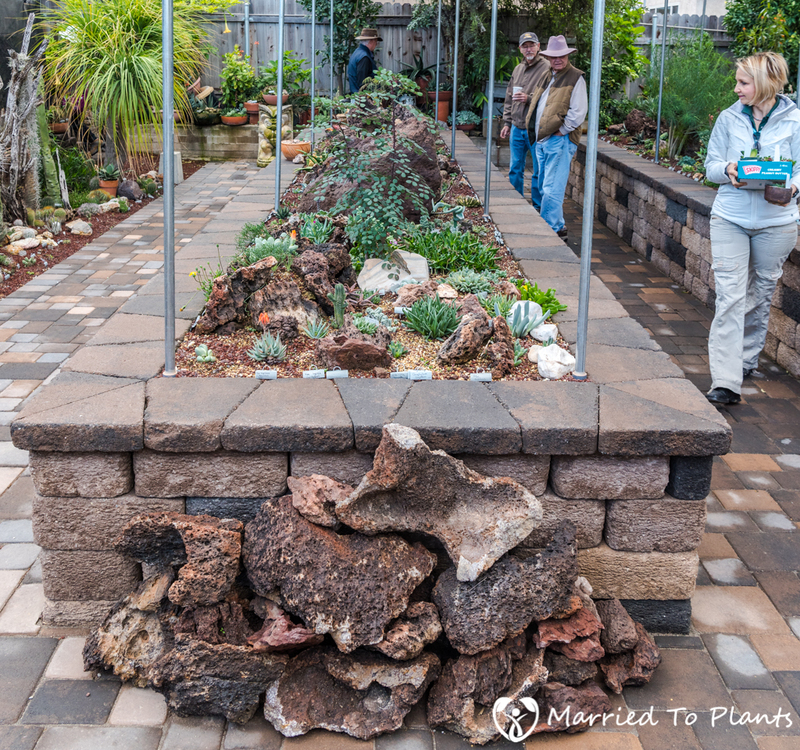 A beautiful garden — I could spend hours looking at the raised garden beds of miniatures. 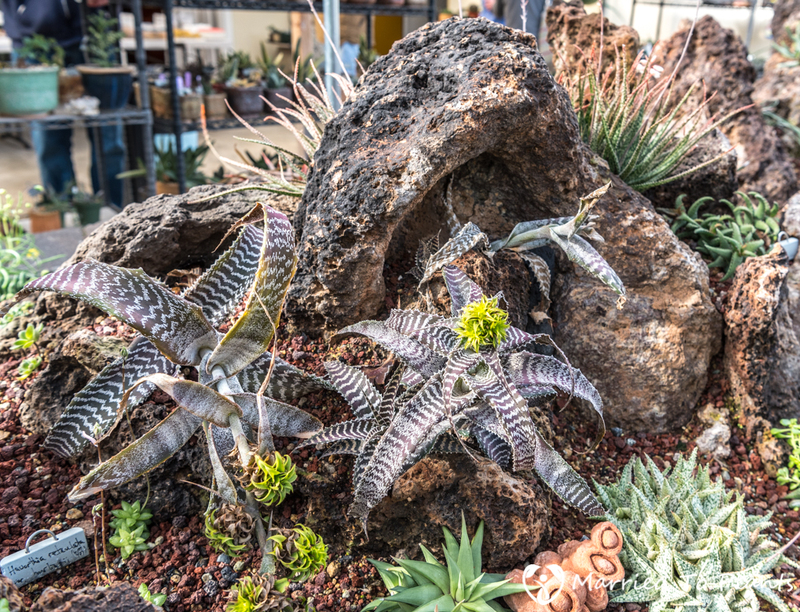 Also, that Cryptanthus type plant is Orthophytum gurkenii — a beautiful plant that is well suited for SoCal. 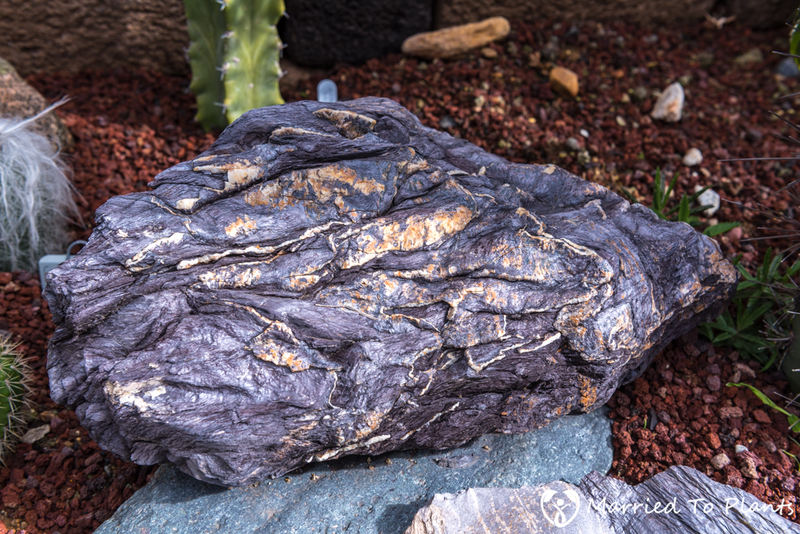 Great garden for collectors of plants and.. .nice rocks. They seem to go hand in hand for many of us. I think the red tree is Euphorbia continifolia. 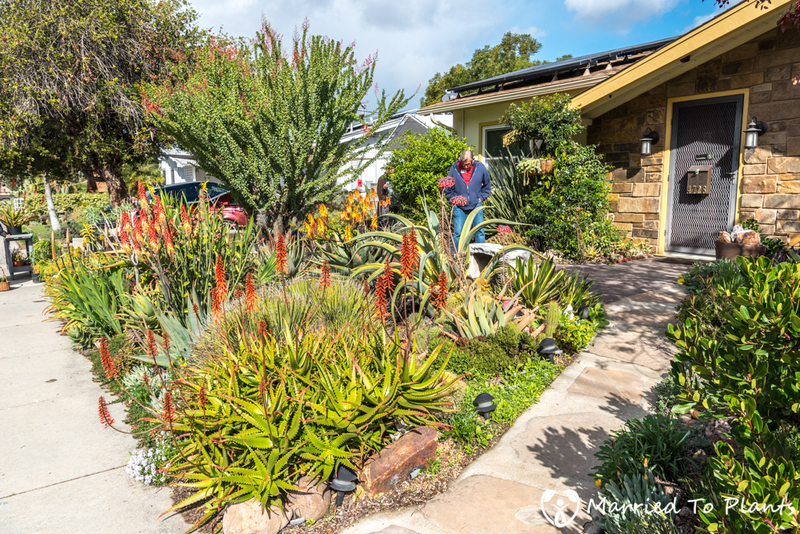 10f cooler winters in the bay area has many of those same Aloe’s in cone…but getting there. This is such a great hobby..never get tired of it. Yes, Stan. 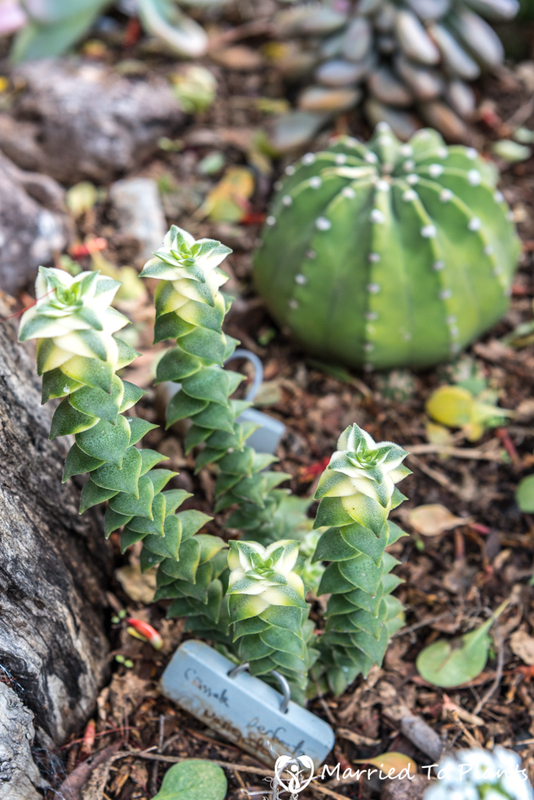 It was a Euphorbia continifolia.